molasses – Real Science at SOEST! HAS MOVED! 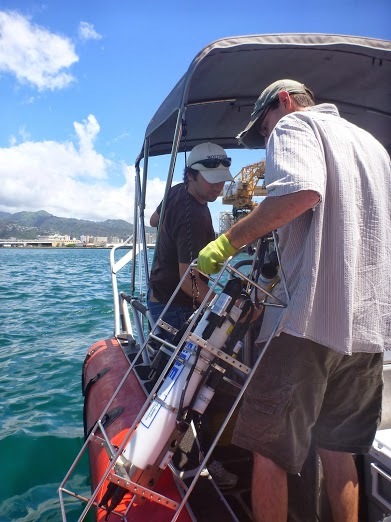 I conduct my oceanographic research on a 186-foot-long ship at Station ALOHA, 60 miles from ‘Oahu and the site of the 25-year-old Hawai’i Ocean Time-series. Cruises last five days and are scheduled well in advance. So I was surprised one evening when my advisor emailed, “we have to go sample the molasses plume right away!” I thought he was joking: What molasses plume? 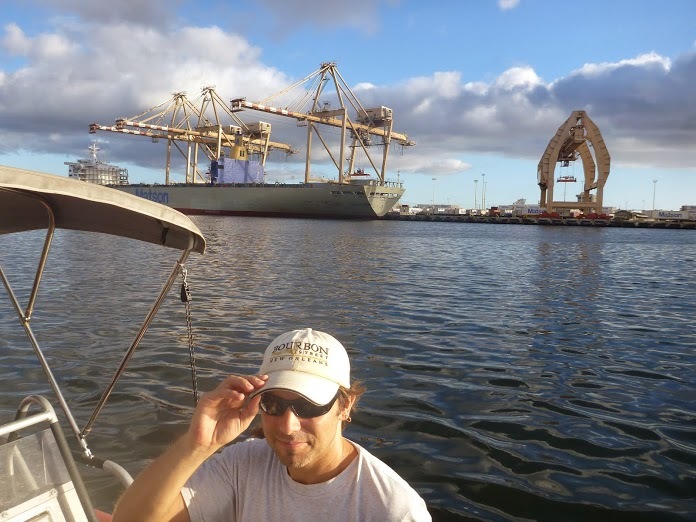 Hundreds of thousands of gallons of molasses were spilling into Honolulu Harbor, and fish were dying by the thousands. As microbial oceanographers, we immediately wanted to know how bacteria were responding. Were they using the molasses to grow like crazy and breathing all the oxygen in the water? We knew the Department of Health would look at fish and potentially harmful bacteria. We didn’t think they would be very interested in the vast majority of microbes that are not dangerous to humans, but we sure were interested! Thirty-six hours later, seven scientists, myself included, arrived at the University of Hawai’i Marine Center with all the equipment we might possibly need. Scientists, captain, boxes of equipment, and the CTD (conductivity-temperature-density) sensor package crowded our 20-foot-long boat. Out in Ke’ehi Lagoon, it was evident that something was wrong. The water was an odd dark color and the air smelled sort of like bread. Later, I saw aerial photos that really showed the discoloration of the water. Lowering the CTD into the molasses plume. We motored down the channel to the places the Department of Health had collected water samples. I’ve never seen so many small crafts in the harbor on any of my past 60 cruises. There were dive flags up everywhere and guys scooping nets for dead fish. It was surreal. Station one, near Aloha Tower, was confusing and disorganized. None of us had used this boat before, and we were crammed like sardines between boxes of empty sample bottles. Two scientists lowered the CTD over the side. To check the sensor depth readout on the laptop screen, I had to crawl along the outside of the boat. 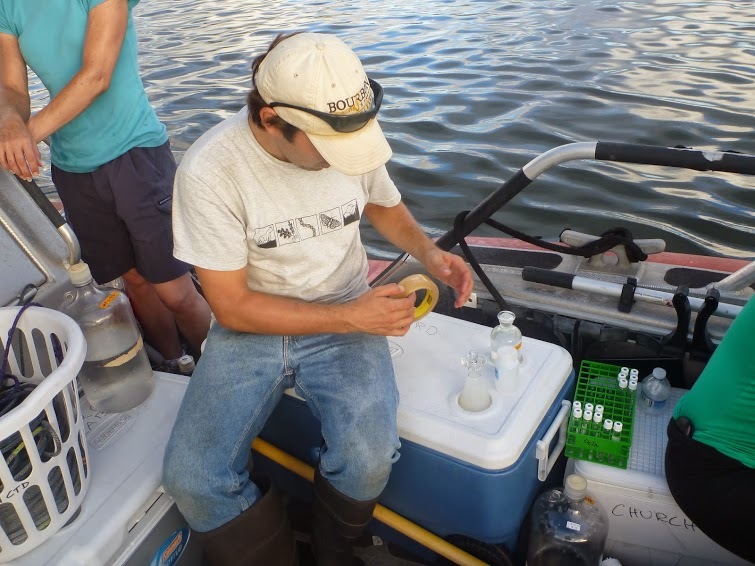 Eventually, we figured it out, filled our bottles with samples, and moved on as more boats arrived. Our second station stunk. Off Pier 38, there was a strong rotten egg smell, causing some of us to say “yuck” and others to say “Wow! Smells like hydrogen sulfide!” We suspected the water below us might be anoxic (no oxygen). Sure enough, the CTD oxygen sensor reported almost no oxygen between the surface and just above the bottom. Anoxic water could explain the dead fish, which would have been suffocated. The molasses was like a huge holiday buffet for bacteria living in the harbor. They ate up all the molasses, breathed all the oxygen, and now some of them were living anaerobically (without oxygen) and releasing hydrogen sulfide. Water at the next two stations also contained very little oxygen. We didn’t smell any hydrogen sulfide, but there were many dead fish floating under the docks at the final station. Taking oxygen measurements on board our “research vessel”. Back in the lab, we analyzed our samples to calibrate our CTD sensors, and to figure out what kind of bacteria were in the harbor and how fast they were growing. We planned a second trip, to look for changes. After washing some bottles, looking at data, and talking to some reporters, we were ready to go back out. Our second cruise, a week later, was like going to a totally different harbor. I saw both Jacks (‘ulua) and flying fish (malolo); I’ve never seen either in the harbor before. At station one, the water surface was covered with a film of zooplankton, small organisms that eat bacteria and phytoplankton. We didn’t smell hydrogen sulfide, and none of the stations were anoxic. It seemed like microbes and water mixing through the harbor had cleaned up the molasses, and larger organisms were moving back in. We’re still analyzing our measurements, but I’ve learned a few things from this experience. First, people get way more interested in my science when it affects something relevant to them, like my Aunties calling me “TV Star” because they saw me get interviewed on the news. Second, lots of interesting science happens in my own backyard. Third, even harbor bacteria have a massive sweet tooth! Donn Viviani is a PhD student studying the partitioning of primary production between particulate and dissolved phases in the North Pacific Subtropical Gyre. He is looking forwarding to contributing more guest posts on spontaneous research in his backyard and beyond.